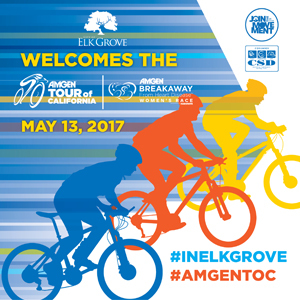 On Saturday, May 13 the City of Elk Grove hosted the morning start of the women's Amgen Tour of California stage 3 race and the crowd gathered at Elk Grove Regional Park was sparse. Sacramento hosted the afternoon finish, and it was well attended, as most race finishes are, with an estimated 40,000 people. Yesterday, Sacramento hosted the start and finish of both the women's and men's races. According to KCRA news, the City of Sacramento has estimated they received about $3 million in economic benefit from the weekend Amgen event. The newscast included interviews with out of town cycling fans who stayed overnight at the local hotels and enjoyed the downtown restaurants. The economic benefit to Elk Grove is uncertain. The Amgen press material provides by the City cites the many Zagat recognized restaurants located in Elk Grove, but it is not certain if any of those restaurants, whatever those may be, were open for breakfast before the race was underway and headed to Sacramento for the exciting finish. Given the sparse participation of the morning event and small possibility it generated out-of-town visitors outside the riders and crew whose accommodations were part of the $89,460 expenditure, the economic benefit to Elk Grove could be minimal. It will be noteworthy to see follow-up staff reports on what, if any, financial windfall were bestowed on taxpayers and locally-owned businesses, and the methodology used to determine that benefit. I believe it is important to look at longer-term impacts as well. By all accounts, our hosting the start was successful and that opens up the potential to host a race finish or a start for the men's race. It was nice to see us pull this off successfully.